Home » Website Building » WordPress » How to Cloak Affiliate Links in WordPress? How to Cloak Affiliate Links in WordPress? Well, cloaking is the term used in SEO for serving different content to search engine crawlers than the real users. This is a black hat SEO technique to trick the search engine aiming to achieve higher ranking on the search results page. But on the affiliate marketing, cloaking is the process of masking the original URL with a pretty and clean URL. Generally the affiliate links looks very long with referrer name and the company name. When you promote such affiliate links, users may not be confident in clicking such URLs. This will directly affect your affiliate earnings. So site owners tend to show the self-hosted URLs with their own domain name instead of showing the other company URL. Before we start with the plugin details, here is a real example of the affiliate link from SiteGround and the pretty cloaked link. It is clear that the click through rate will be higher with the cloaked link thus increasing the possibility of getting more affiliate commission. Some companies like SiteGround also allows to shorten the URL but with their domain name. There are also many URL shortening services available like bit.ly. All URL shortening services will use their domain name. But cloaking with WordPress plugin will allow you to show the URL with your own domain name. WordPress has many plugins to do the cloaking and here we will discuss cloaking with the popular and free Pretty Link Lite plugin. Why Pretty Link Lite Plugin? It is a free plugin can be installed from the plugin repository. It has an active installs of over 200k sites. Developer updates the plugin regularly to make it compatible with the latest WordPress version. Very good support on the forum. Good rating of 4.3 out of 5. Ver easy to create the cloaked URL. Hit count on each URL. The plugin also has a pro version which is not required for individual WordPress users. How to Create Cloaked Link for Your Affiliate Link? Install and activate Pretty Link Lite plugin from your WordPress admin panel. 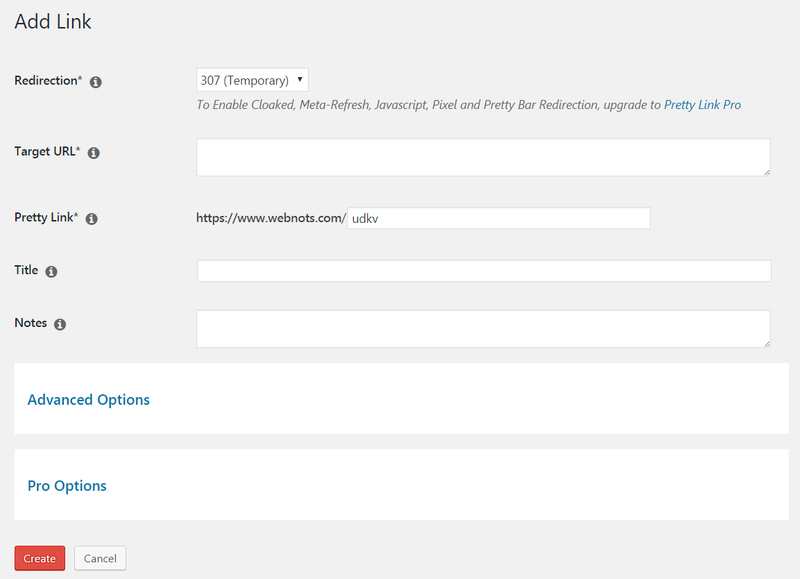 The plugin will create a menu in the sidebar with the name “Pretty Link”. Navigate to “Pretty Link > Add New Link”. Redirection – you can set either 301 or 302 or 307 redirect for your cloaked link. 301 is a permanent redirection which is not recommended. 302 and 307 are temporary redirects and you can choose one of them for your link. Target URL – enter the affiliate URL. Pretty Link – enter your pretty link URL. You can enter multiple level like “go/bluehost” or “out/hostgator”. So your final pretty URL will look like “https://yoursite.com/go/bluehost”. Remember you can’t provide the trailing slash (/) at the end of the URL. Title – this is a title for your cloaked link. You can enter your own or leave it blank so that the plugin will use title of the target URL. Notes – this is a private note for you to identify the affiliate link. The plugin does not use this field in any other place. So you can leave it blank. Click on the “Advanced Options” link to customize further. Group – you can group the affiliate links so that it is easy to view the statistics. For example, create two groups like “WordPress Themes” and “WordPress Plugins” to group all your themes and plugins affiliate links. No Follow – enabling this checkbox will set no-follow and no-index option for the link. 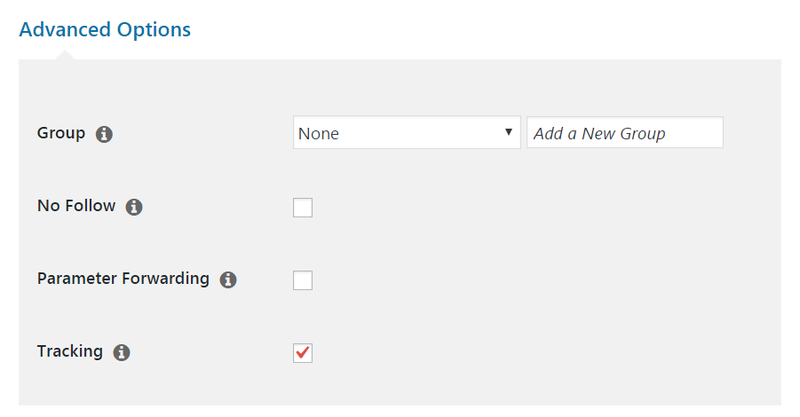 Ensure to check this box so that search engines will not index and follow your affiliate links. Otherwise the link juice will be send to the affiliate domain which should be avoided. Parameter Forwarding – enable if you want to use parameter forwarding with the target URL. Leave it blank if you don’t want to use. Tracking – enable this option so that the plugin will track and the click statistics can be seen for the link. After filling the required details and choosing advanced options, click on the “Create” button to generate a cloaked affiliate link. All the created links can be seen as a dashboard under “Pretty Link > Pretty Link> menu. The plugin also offers click analysis for each link which will help you tracking the performance of cloaked links. You can also view the stats for group of links under “Pretty Link > Groups” tab. The reporting options can be customized under the “Options” menu. Also there is a “Bookmarklet” tool available under “Tools” menu which will help you generating cloaked URL from the site your are viewing.